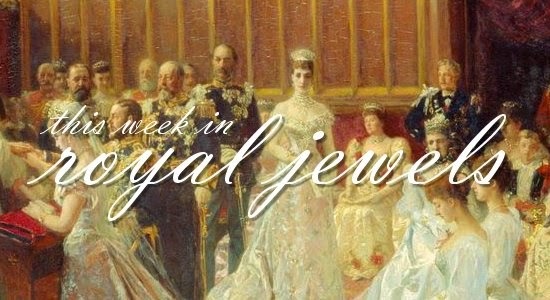 With state visits, foreign trips, and awards ceremonies on the docket this week, you know there are some serious royal jewels for us to discuss! Enjoy! 10. Crown Princess Victoria and Prince Daniel are on a visit to Estonia this week. For a meeting with the country's president on Tuesday, Victoria wore gold jewelry, including a very modern necklace with triangular pennants. 9. Before departing for their state visit to Japan, King Willem-Alexander and Queen Maxima welcomed the Governor-General of Canada to the Netherlands. Max let her statement earrings do the talking at the photo op. 8. On Wednesday, Crown Prince Frederik and Crown Princess Mary attended a chamber of commerce gala in Copenhagen. Mary wore a gorgeous pair of blue topaz, diamond, and sapphire earrings with her blue and black gown. 7. Lots of jewels for Queen Letizia this week, including a glittering appearance at a gala for the President of Chile. On Friday, she and King Felipe attended the last Prince of Asturias Awards (next year they'll be the Princess of Asturias Awards), and she added diamond and aquamarine earrings by Bulgari to her outfit. 6. In Tokyo on Wednesday, Queen Maxima wore a pair of mod new gold earrings with green stones, plus the family's diamond and emerald butterfly brooch, part of Queen Emma's jewelry collection. 5. While visiting Wolverhampton on Thursday, Queen Elizabeth II wore a brooch featuring a Tudor rose design. The piece is a fairly new addition to her collection, possibly acquired around the time of the Diamond Jubilee. 3. The Prince of Wales and the Duchess of Cornwall are on an extended trip to Colombia and Mexico at the moment, and Camilla has already worn some serious jewels. At the ambassador's residence in Bogota on Wednesday, she chose one of her familiar pieces: the pearl necklace with the all-diamond clasp. 2. For a gala dinner at the presidential palace on Wednesday evening, Camilla brought out the bling. Diamond and pearl earrings, a diamond bracelet, and her diamond snake pendant -- which features tiny ruby eyes and was probably a gift from Charles -- completed her ensemble. 1. But I've saved the best royal jewel news for last: we've got a new addition to Camilla's collection! The President of Colombia's gift to Camilla during the trip was an absolutely gorgeous pair of uncut emerald earrings. Colombia is known for its emerald mines, and some of the emerald jewels you see royal ladies wearing feature Colombian stones. I cannot wait to see Camilla wear these!